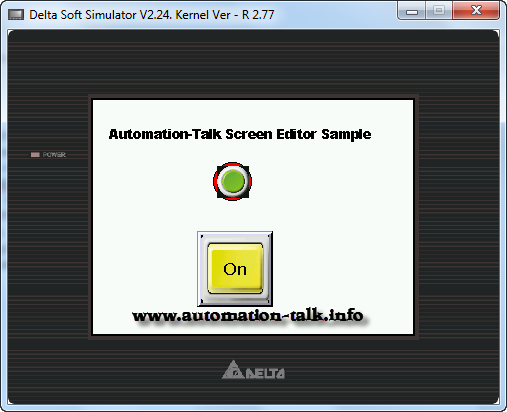 Screen Editor is the HMI software for Delta human machine interface. This Screen editor software is available in 2 flavors, one for DOP-A Series HMI and other for DOP-B Series. In this tutorial we are making a sample HMI program for Delta DOP-B series. This sample program is made using a Button to ON and OFF and a Indicator used as a lamp. When we will press the On button, the lamp will glow and vice-versa. This is just a very basic program. Subscribe to Automation-Talk by Email. 1. 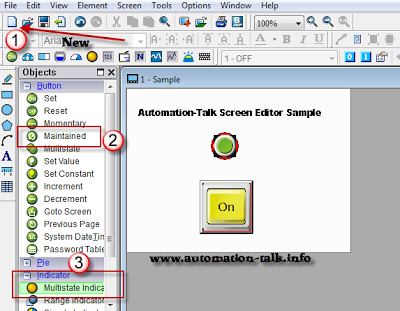 Open Screen Editor software and click on New to make your first screen. 2. Now click on Button and take a Maintained type button so that we can use same button for ON/Off. Take internal memory bit $M0.1 as a Write Address. 3. Now click on Indicator and take a Multistage Indicator as shown below. Take internal memory bit $M0.1 as a Read Address. Note : To run this sample program we are using internal memory bits as Screen Editor has On-line Simulation property. Now to see your HMI program on action just click the Simulation button and click on ON and OFF button. You will see below ON/Off Screen. 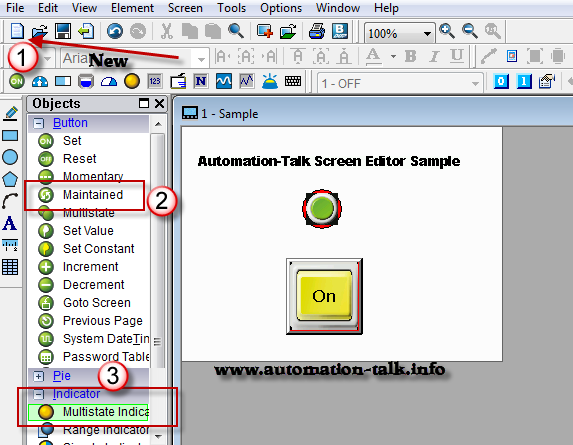 If you are still having issue making your HMI program on Screen Editor, please leave your comment. @Danish > what base port controller you are selecting for Siemens? And also tell us the exact DOP-B Series HMI type. And also set correct COM setting in HMI configuration tab i.e IP and port. HOW CAN I COMMUNICATE THROUGH MODBUS TO MY DELTA,DOP B SERIES HMI ? how to create a backup of the program in the Delta HMI. Does Upload Data & Recipe function transfers the data from hmi to pc? We spent lakhs on buying the machines and why do the service people put a password on it and never give us? @Daya : You will need Delta HMI cable to save backup on your laptop or PC. And all the program including any function and recipe can be downloaded or uploaded. I think they don't want to loose customer like you. 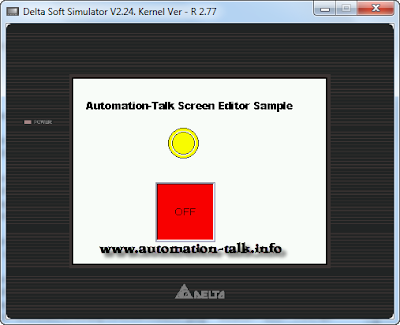 Delta HMI software is free, so you can download it and use HMI programming cable to transfer the program to your PC. Hi, I have been messing around with DVP-14SS for a while and just bought a HMI DOP-B05S111. Can you please kindly teach me how to communicate between them from the very basic as I don't really understand your modbus tutorial. I would prefer an example, say, pressing a button in the DOP to trigger output Y0 of DVP. If possible, please show me the pin out of communication cable. Thank you. can i use different software for delta hmi instead of screen editor or dopsoft? Delta HMI can only be programmed through delta software, so use that only.